Last weekend I enjoyed a warm welcome in the warm climate of New Mexico that provided a welcomed pause in the coldest winter in my state since 1931. Truly can’t thank Nancy Allen and the attendees at UNM Lovelace Rehab Hospital in Albuquerque for their time, energy and attendance to the many details and nuances of Pelvis Restoration. With nearly all course attendees attending their first Pelvis Restoration course and the majority attending their first PRI course, this was a unique opportunity for this instructor to be able to gear the course slightly more focally to a specific perspective. This entire group embraced tangible lab time and during labs we had the opportunity to look at many facilitation techniques and demonstrate a series of inhibition techniques for those whose 8 Pelvis Restoration special tests revealed specific need for inhibition in 4 quadrants of the pelvis, two in the inlet and outlet respectively. 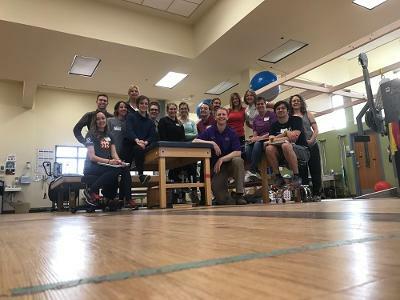 Thanks to Colin Kidwell, Mary Claire “Intensity” Aaron, “athletic play Ben” Hendricks, Amy Link and nearly every attendee for volunteering for demonstrations for everything from a posterior mediastinum with volume to a left posterior outlet in need of inhibition. Case studies and application questions abounded and there were many discussing integration concepts, feeling the principles of Pelvis PRI while practicing techniques intermittently throughout the back half of day two…reminding me how much I enjoy seeing the eyes of new attendees light up when the science of PRI “clicks” for the first time. Thanks again Nancy for staying the course with PRI and providing a great weekend of learning for all of us. Warm weekend on many fronts!